In this issue, Vornhagen et al. 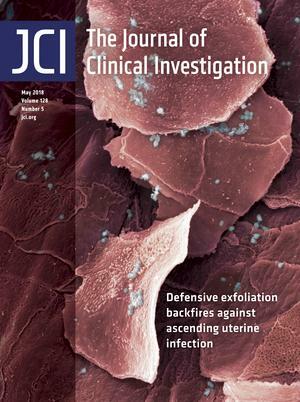 report that group B streptococcus infection is not impeded by defensive epithelial exfoliation; rather than limit colonization, the exfoliation facilitates bacterial migration, boosting the incidence of uterine infection that increases preterm birth risk. The cover image shows streptococcal bacteria present on exfoliated vaginal epithelial cells at high magnification. Citation Information: J Clin Invest. 2018;128(5):1709-1710. https://doi.org/10.1172/JCI121197. Citation Information: J Clin Invest. 2018;128(5):1720-1723. https://doi.org/10.1172/JCI120415. Current therapies for pulmonary arterial hypertension (PAH) provide symptomatic relief and improve prognosis but fall short of improving long-term survival. There is emerging evidence for a role of inflammatory mediators, primarily IL-6, in the pathogenesis of PAH. However, the mechanisms by which IL-6 potentially affects PAH are unknown. In this issue of the JCI, Tamura, Phan, and colleagues identified ectopic upregulation of the membrane-bound IL-6 receptor (IL6R), indicating classical IL-6 signaling in the smooth muscle layer of remodeled vessels in human and experimental PAH. They performed a series of in vitro and in vivo experiments that provide deeper insights into the mechanisms of classical IL-6 signaling and propose interventions directed against IL6R as a potential therapeutic strategy for PAH. Citation Information: J Clin Invest. 2018;128(5):1727-1730. https://doi.org/10.1172/JCI120388. Poly(ADP-ribose) polymerase inhibitors (PARPis) are DNA-damaging agents that trap PARP-DNA complexes and interfere with DNA replication. Three PARPis — olaparib, niraparib, and rucaparib — were recently approved by the FDA for the treatment of breast and ovarian cancers. These PARPis, along with 2 others (talazoparib and veliparib), are being evaluated for their potential to treat additional malignancies, including prostate cancers. While lack of PARP-1 confers high resistance to PARPis, it has not been established whether or not the levels of PARP-1 directly correlate with tumor response. In this issue of the JCI, Makvandi and coworkers describe an approach to address this question using [18F]FluorThanatrace, an [18F]-labeled PARP-1 inhibitor, for PET. The tracer was taken up by patient tumor tissue and appeared to differentiate levels of PARP-1 expression; however, future studies should be aimed at determining if this tracer can be used to stratify patient response to PARPi therapy. Citation Information: J Clin Invest. 2018;128(5):1731-1733. https://doi.org/10.1172/JCI121079. The identity and function of the fibroblast, a highly prevalent cell type in the heart, have remained poorly defined. Recent faithful genetic lineage–tracing studies revealed that during development, the cardiac fibroblasts are derived from the epicardium and the endothelium, whereas in the adult heart, they constitute the cardiac injury–responsive resident fibroblast. In the current issue of the JCI, Molkentin and colleagues decipher the time course and mechanism of the fibroblast in response to myocardial infarction (MI). The model they propose is surprisingly simple and clear. It consists of three major phases. First, fibroblasts in the ischemic area die. Second, surrounding fibroblasts proliferate and migrate into the spaces created by dying cardiomyocytes over a few days. The new fibroblasts in the scar are activated and adopt a smooth muscle actin– and periostin-positive “myofibroblast” phenotype, which appears to last as long as the scar is not mature (~10 days after MI). In the third phase, initially proliferating myofibroblasts lose smooth muscle actin expression and convert to a nonproliferating, matrix-producing phenotype with a newly acquired tendon gene signature. Interestingly, this state appears to differ from that of quiescent fibroblasts in the uninjured heart, as it is resistant to proliferative stimuli. These cells are therefore termed “matrifibrocytes,” a novel category whose study will certainly further advance the field. Citation Information: J Clin Invest. 2018;128(5):1734-1736. https://doi.org/10.1172/JCI120414. Inheritance of the E4 allele of the apolipoprotein E gene (APOE4) substantially increases the risk of developing late-onset Alzheimer disease (AD). A large body of evidence has firmly established a role for apoE in modulating the risk of developing the amyloid plaque pathology that is pathognomonic for AD. In this issue of the JCI, Liao and colleagues discovered that antibodies against a nonlipidated form of apoE4 are highly effective in delaying the deposition of amyloid β (Aβ) peptides in mouse models of AD pathology. Using a combination of passive immunization and viral-mediated expression of recombinant antibodies, the authors show that Fc receptor–mediated clearance of the nonlipidated apoE4 was critical in delaying Aβ deposition. Collectively, this study identifies a new therapeutic target that could be exploited to prevent, or possibly reverse, the Aβ pathology of AD. Citation Information: J Clin Invest. 2018;128(5):1752-1771. https://doi.org/10.1172/JCI94584. Gout is the most common inflammatory arthritis affecting men. Acute gouty inflammation is triggered by monosodium urate (MSU) crystal deposition in and around joints that activates macrophages into a proinflammatory state, resulting in neutrophil recruitment. A complete understanding of how MSU crystals activate macrophages in vivo has been difficult because of limitations of live imaging this process in traditional animal models. By live imaging the macrophage and neutrophil response to MSU crystals within an intact host (larval zebrafish), we reveal that macrophage activation requires mitochondrial ROS (mROS) generated through fatty acid oxidation. This mitochondrial source of ROS contributes to NF-κB–driven production of IL-1β and TNF-α, which promote neutrophil recruitment. We demonstrate the therapeutic utility of this discovery by showing that this mechanism is conserved in human macrophages and, via pharmacologic blockade, that it contributes to neutrophil recruitment in a mouse model of acute gouty inflammation. To our knowledge, this study is the first to uncover an immunometabolic mechanism of macrophage activation that operates during acute gouty inflammation. Targeting this pathway holds promise in the management of gout and, potentially, other macrophage-driven diseases. Citation Information: J Clin Invest. 2018;128(5):1772-1786. https://doi.org/10.1172/JCI97837. Citation Information: J Clin Invest. 2018;128(5):1793-1806. https://doi.org/10.1172/JCI98642. In these studies, we evaluated the contribution of the NLRP3 inflammasome to Crohn’s disease (CD) in a kindred containing individuals having a missense mutation in CARD8, a protein known to inhibit this inflammasome. Whole exome sequencing and PCR studies identified the affected individuals as having a V44I mutation in a single allele of the T60 isoform of CARD8. The serum levels of IL-1β in the affected individuals were increased compared with those in healthy controls, and their peripheral monocytes produced increased amounts of IL-1β when stimulated by NLRP3 activators. Immunoblot studies probing the basis of these findings showed that mutated T60 CARD8 failed to downregulate the NLRP3 inflammasome because it did not bind to NLRP3 and inhibit its oligomerization. In addition, these studies showed that mutated T60 CARD8 exerted a dominant-negative effect by its capacity to bind to and form oligomers with unmutated T60 or T48 CARD8 that impeded their binding to NLRP3. Finally, inflammasome activation studies revealed that intact but not mutated CARD8 prevented NLRP3 deubiquitination and serine dephosphorylation. CD due to a CARD8 mutation was not effectively treated by anti–TNF-α, but did respond to IL-1β inhibitors. Thus, patients with anti–TNF-α–resistant CD may respond to this treatment option. Citation Information: J Clin Invest. 2018;128(5):1807-1819. https://doi.org/10.1172/JCI99088. Fibrosis is a prevalent pathological condition arising from the chronic activation of fibroblasts. This activation results from the extensive intercellular crosstalk mediated by both soluble factors and direct cell-cell connections. Prominent among these are the interactions of fibroblasts with immune cells, in which the fibroblast–mast cell connection, although acknowledged, is relatively unexplored. We have used a Tg mouse model of skin fibrosis, based on expression of the transcription factor Snail in the epidermis, to probe the mechanisms regulating mast cell activity and the contribution of these cells to this pathology. We have discovered that Snail-expressing keratinocytes secrete plasminogen activator inhibitor type 1 (PAI1), which functions as a chemotactic factor to increase mast cell infiltration into the skin. Moreover, we have determined that PAI1 upregulates intercellular adhesion molecule type 1 (ICAM1) expression on dermal fibroblasts, rendering them competent to bind to mast cells. This heterotypic cell-cell adhesion, also observed in the skin fibrotic disorder scleroderma, culminates in the reciprocal activation of both mast cells and fibroblasts, leading to the cascade of events that promote fibrogenesis. Thus, we have identified roles for PAI1 in the multifactorial program of fibrogenesis that expand its functional repertoire beyond its canonical role in plasmin-dependent processes. Citation Information: J Clin Invest. 2018;128(5):1820-1836. https://doi.org/10.1172/JCI97280. The immune system is tightly controlled by regulatory processes that allow for the elimination of invading pathogens, while limiting immunopathological damage to the host. In the present study, we found that conditional deletion of the cell surface receptor Toso on B cells unexpectedly resulted in impaired proinflammatory T cell responses, which led to impaired immune protection in an acute viral infection model and was associated with reduced immunopathological tissue damage in a chronic inflammatory context. Toso exhibited its B cell–inherent immunoregulatory function by negatively controlling the pool of IL-10–competent B1 and B2 B cells, which were characterized by a high degree of self-reactivity and were shown to mediate immunosuppressive activity on inflammatory T cell responses in vivo. Our results indicate that Toso is involved in the differentiation/maintenance of regulatory B cells by fine-tuning B cell receptor activation thresholds. Furthermore, we showed that during influenza A–induced pulmonary inflammation, the application of Toso-specific antibodies selectively induced IL-10–competent B cells at the site of inflammation and resulted in decreased proinflammatory cytokine production by lung T cells. These findings suggest that Toso may serve as a novel therapeutic target to dampen pathogenic T cell responses via the modulation of IL-10–competent regulatory B cells. Citation Information: J Clin Invest. 2018;128(5):1837-1851. https://doi.org/10.1172/JCI97508. The lack of defined correlates of protection hampers development of vaccines against tuberculosis (TB). In vitro mycobacterial outgrowth assays are thought to better capture the complexity of the human host/Mycobacterium tuberculosis (Mtb) interaction. Here, we used a mycobacterial growth inhibition assay (MGIA) based on peripheral blood mononuclear cells to investigate the capacity to control outgrowth of bacille Calmette-Guérin (BCG). Interestingly, strong control of BCG outgrowth was observed almost exclusively in individuals with recent exposure to Mtb, but not in (long-term) latent TB infection, and only modestly in BCG vaccinees. Mechanistically, control of mycobacterial outgrowth strongly correlated with the presence of a CD14dim monocyte population, but also required the presence of T cells. The nonclassical monocytes produced CXCL10, and CXCR3 receptor blockade inhibited the capacity to control BCG outgrowth. Expression of CXCR3 splice variants was altered in recently Mtb-exposed individuals. Cytokines previously associated with trained immunity were detected in MGIA supernatants, and CXCL9, CXCL10, and CXCL11 represent new markers of trained immunity. These data indicate that CXCR3 ligands are associated with trained immunity and are critical factors in controlling mycobacterial outgrowth. In conclusion, control of mycobacterial outgrowth early after exposure to Mtb is the result of trained immunity mediated by a CXCL10-producing nonclassical CD14dim monocyte subset. Citation Information: J Clin Invest. 2018;128(5):1852-1866. https://doi.org/10.1172/JCI89867. Citation Information: J Clin Invest. 2018;128(5):1867-1872. https://doi.org/10.1172/JCI96708. Immune evasion and the suppression of antitumor responses during cancer progression are considered hallmarks of cancer and are typically attributed to tumor-derived factors. Although the molecular basis for the crosstalk between tumor and immune cells is an area of active investigation, whether host-specific germline variants can dictate immunosuppressive mechanisms has remained a challenge to address. A commonly occurring germline mutation (c.1162G>A/rs351855 G/A) in the FGFR4 (CD334) gene enhances signal transducer and activator of transcription 3 (STAT3) signaling and is associated with poor prognosis and accelerated progression of multiple cancer types. Here, using rs351855 SNP–knockin transgenic mice and Fgfr4-knockout mice, we reveal the genotype-specific gain of immunological function of suppressing the CD8/CD4+FOXP3+CD25+ regulatory T cell ratio in vivo. Furthermore, using knockin transgenic mouse models for lung and breast cancers, we establish the host-specific, tumor-extrinsic functions of STAT3-enhancing germline variants in impeding the tumor infiltration of CD8 T cells. Thus, STAT3-enhancing germline receptor variants contribute to immune evasion through their pleiotropic functions in immune cells. Citation Information: J Clin Invest. 2018;128(5):1873-1887. https://doi.org/10.1172/JCI97333. Uncontrolled secretion of type I IFN, as the result of endosomal TLR (i.e., TLR7 and TLR9) signaling in plasmacytoid DCs (pDCs), and abnormal production of autoantibodies by B cells are critical for systemic lupus erythematosus (SLE) pathogenesis. The importance of galectin-9 (Gal-9) in regulating various autoimmune diseases, including lupus, has been demonstrated. However, the precise mechanism by which Gal-9 mediates this effect remains unclear. Here, using spontaneous murine models of lupus (i.e., BXSB/MpJ and NZB/W F1 mice), we demonstrate that administration of Gal-9 results in reduced TLR7-mediated autoimmune manifestations. While investigating the mechanism underlying this phenomenon, we observed that Gal-9 inhibits the phenotypic maturation of pDCs and B cells and abrogates their ability to mount cytokine responses to TLR7/TLR9 ligands. Importantly, immunocomplex-mediated (IC-mediated) and neutrophil extracellular trap–mediated (NET-mediated) pDC activation was inhibited by Gal-9. Additionally, the mTOR/p70S6K pathway, which is recruited by both pDCs and B cells for TLR-mediated IFN secretion and autoantibody generation, respectively, was attenuated. Gal-9 was found to exert its inhibitory effect on both the cells by interacting with CD44. Citation Information: J Clin Invest. 2018;128(5):1888-1902. https://doi.org/10.1172/JCI97739. Major histocompatibility (MHC) class II molecules are strongly associated with many autoimmune disorders. In type 1 diabetes (T1D), the DQ8 molecule is common, confers significant disease risk, and is involved in disease pathogenesis. We hypothesized that blocking DQ8 antigen presentation would provide therapeutic benefit by preventing recognition of self-peptides by pathogenic T cells. We used the crystal structure of DQ8 to select drug-like small molecules predicted to bind structural pockets in the MHC antigen–binding cleft. A limited number of the predicted compounds inhibited DQ8 antigen presentation in vitro, with 1 compound preventing insulin autoantibody production and delaying diabetes onset in an animal model of spontaneous autoimmune diabetes. An existing drug with a similar structure, methyldopa, specifically blocked DQ8 in patients with recent-onset T1D and reduced inflammatory T cell responses to insulin, highlighting the relevance of blocking disease-specific MHC class II antigen presentation to treat autoimmunity. Citation Information: J Clin Invest. 2018;128(5):1903-1912. https://doi.org/10.1172/JCI98463. HLA-B*57 control of HIV involves enhanced CD8+ T cell responses against infected cells, but extensive heterogeneity exists in the level of HIV control among B*57+ individuals. Using whole-genome sequencing of untreated B*57+ HIV-1–infected controllers and noncontrollers, we identified a single variant (rs643347A/G) encoding an isoleucine-to-valine substitution at position 47 (I47V) of the inhibitory killer cell immunoglobulin-like receptor KIR3DL1 as the only significant modifier of B*57 protection. The association was replicated in an independent cohort and across multiple outcomes. The modifying effect of I47V was confined to B*57:01 and was not observed for the closely related B*57:03. Positions 2, 47, and 54 tracked one another nearly perfectly, and 2 KIR3DL1 allotypes differing only at these 3 positions showed significant differences in binding B*57:01 tetramers, whereas the protective allotype showed lower binding. Thus, variation in an immune NK cell receptor that binds B*57:01 modifies its protection. These data highlight the exquisite specificity of KIR-HLA interactions in human health and disease. Citation Information: J Clin Invest. 2018;128(5):1937-1955. https://doi.org/10.1172/JCI95089. Altered epigenetic reprogramming contributes to breast cancer progression and metastasis. How the epigenetic reader mediates breast cancer progression remains poorly understood. Here, we showed that the epigenetic reader zinc finger MYND-type containing 8 (ZMYND8) is induced by HIF-1 and HIF-2 in breast cancer cells and also upregulated in human breast tumors, and is correlated with poor survival of patients with breast cancer. Genetic deletion of ZMYND8 decreases breast cancer cell colony formation, migration, and invasion in vitro, and inhibits breast tumor growth and metastasis to the lungs in mice. The ZMYND8’s oncogenic effect in breast cancer requires HIF-1 and HIF-2. We further showed that ZMYND8 interacts with HIF-1α and HIF-2α and enhances elongation of the global HIF-induced oncogenic genes by increasing recruitment of BRD4 and subsequent release of paused RNA polymerase II in breast cancer cells. ZMYND8 acetylation at lysines 1007 and 1034 by p300 is required for HIF activation and breast cancer progression and metastasis. These findings uncover a primary epigenetic mechanism of HIF activation and HIF-mediated breast cancer progression, and discover a possible molecular target for the diagnosis and treatment of breast cancer. Citation Information: J Clin Invest. 2018;128(5):1956-1970. https://doi.org/10.1172/JCI96462. Pulmonary arterial hypertension (PAH) is characterized by a progressive accumulation of pulmonary artery smooth muscle cells (PA-SMCs) in pulmonary arterioles leading to the narrowing of the lumen, right heart failure, and death. Although most studies have supported the notion of a role for IL-6/glycoprotein 130 (gp130) signaling in PAH, it remains unclear how this signaling pathway determines the progression of the disease. Here, we identify ectopic upregulation of membrane-bound IL-6 receptor (IL6R) on PA-SMCs in PAH patients and in rodent models of pulmonary hypertension (PH) and demonstrate its key role for PA-SMC accumulation in vitro and in vivo. Using Sm22a-Cre Il6rfl/fl, which lack Il6r in SM22A-expressing cells, we found that these animals are protected against chronic hypoxia–induced PH with reduced PA-SMC accumulation, revealing the potent pro-survival potential of membrane-bound IL6R. Moreover, we determine that treatment with IL6R-specific antagonist reverses experimental PH in two rat models. This therapeutic strategy holds promise for future clinical studies in PAH. Citation Information: J Clin Invest. 2018;128(5):1971-1984. https://doi.org/10.1172/JCI96791. Non–antigen-specific stimulatory cancer immunotherapies are commonly complicated by off-target effects. Antigen-specific immunotherapy, combining viral tumor antigen or personalized neoepitopes with immune targeting, offers a solution. However, the lack of flexible systems targeting tumor antigens to cross-presenting dendritic cells (DCs) limits clinical development. Although antigen–anti-Clec9A mAb conjugates target cross-presenting DCs, adjuvant must be codelivered for cytotoxic T lymphocyte (CTL) induction. We functionalized tailored nanoemulsions encapsulating tumor antigens to target Clec9A (Clec9A-TNE). Clec9A-TNE encapsulating OVA antigen targeted and activated cross-presenting DCs without additional adjuvant, promoting antigen-specific CD4+ and CD8+ T cell proliferation and CTL and antibody responses. OVA-Clec9A-TNE–induced DC activation required CD4 and CD8 epitopes, CD40, and IFN-α. Clec9A-TNE encapsulating HPV E6/E7 significantly suppressed HPV-associated tumor growth, while E6/E7–CpG did not. Clec9A-TNE loaded with pooled B16-F10 melanoma neoepitopes induced epitope-specific CD4+ and CD8+ T cell responses, permitting selection of immunogenic neoepitopes. Clec9A-TNE encapsulating 6 neoepitopes significantly suppressed B16-F10 melanoma growth in a CD4+ T cell–dependent manner. Thus, cross-presenting DCs targeted with antigen–Clec9A-TNE stimulate therapeutically effective tumor-specific immunity, dependent on T cell help. Citation Information: J Clin Invest. 2018;128(5):1985-1999. https://doi.org/10.1172/JCI97043. Citation Information: J Clin Invest. 2018;128(5):2010-2024. https://doi.org/10.1172/JCI97454. A key predictor for the success of gene-modified T cell therapies for cancer is the persistence of transferred cells in the patient. The propensity of less differentiated memory T cells to expand and survive efficiently has therefore made them attractive candidates for clinical application. We hypothesized that redirecting T cells to specialized niches in the BM that support memory differentiation would confer increased therapeutic efficacy. We show that overexpression of chemokine receptor CXCR4 in CD8+ T cells (TCXCR4) enhanced their migration toward vascular-associated CXCL12+ cells in the BM and increased their local engraftment. Increased access of TCXCR4 to the BM microenvironment induced IL-15–dependent homeostatic expansion and promoted the differentiation of memory precursor–like cells with low expression of programmed death-1, resistance to apoptosis, and a heightened capacity to generate polyfunctional cytokine-producing effector cells. Following transfer to lymphoma-bearing mice, TCXCR4 showed a greater capacity for effector expansion and better tumor protection, the latter being independent of changes in trafficking to the tumor bed or local out-competition of regulatory T cells. Thus, redirected homing of T cells to the BM confers increased memory differentiation and antitumor immunity, suggesting an innovative solution to increase the persistence and functions of therapeutic T cells. Citation Information: J Clin Invest. 2018;128(5):2025-2041. https://doi.org/10.1172/JCI94158. Cerebral white matter injury (WMI) persistently disrupts myelin regeneration by oligodendrocyte progenitor cells (OPCs). We identified a specific bioactive hyaluronan fragment (bHAf) that downregulates myelin gene expression and chronically blocks OPC maturation and myelination via a tolerance-like mechanism that dysregulates pro-myelination signaling via AKT. Desensitization of AKT occurs via TLR4 but not TLR2 or CD44. OPC differentiation was selectively blocked by bHAf in a maturation-dependent fashion at the late OPC (preOL) stage by a noncanonical TLR4/TRIF pathway that induced persistent activation of the FoxO3 transcription factor downstream of AKT. Activated FoxO3 selectively localized to oligodendrocyte lineage cells in white matter lesions from human preterm neonates and adults with multiple sclerosis. FoxO3 constraint of OPC maturation was bHAf dependent, and involved interactions at the FoxO3 and MBP promoters with the chromatin remodeling factor Brg1 and the transcription factor Olig2, which regulate OPC differentiation. WMI has adapted an immune tolerance–like mechanism whereby persistent engagement of TLR4 by bHAf promotes an OPC niche at the expense of myelination by engaging a FoxO3 signaling pathway that chronically constrains OPC differentiation. Citation Information: J Clin Invest. 2018;128(5):2042-2047. https://doi.org/10.1172/JCI98446. Mice homozygous for the Tyr208Asn amino acid substitution in the carboxy terminus of Src homology region 2 (SH2) domain–containing phosphatase 1 (SHP-1) (referred to as Ptpn6spin mice) spontaneously develop a severe inflammatory disease resembling neutrophilic dermatosis in humans. Disease in Ptpn6spin mice is characterized by persistent footpad swelling and suppurative inflammation. Recently, in addition to IL-1α and IL-1R signaling, we demonstrated a pivotal role for several kinases such as SYK, RIPK1, and TAK1 in promoting inflammatory disease in Ptpn6spin mice. In order to identify new kinases involved in SHP-1–mediated inflammation, we took a genetic approach and discovered apoptosis signal–regulating kinases 1 and 2 (ASK1 and ASK2) as novel kinases regulating Ptpn6-mediated footpad inflammation. Double deletion of ASK1 and ASK2 abrogated cutaneous inflammatory disease in Ptpn6spin mice. This double deletion further rescued the splenomegaly and lymphomegaly caused by excessive neutrophil infiltration in Ptpn6spin mice. Mechanistically, ASK regulates Ptpn6spin-mediated disease by controlling proinflammatory signaling in the neutrophils. Collectively, the present study identifies SHP-1 and ASK signaling crosstalk as a critical regulator of IL-1α–driven inflammation and opens future avenues for finding novel drug targets to treat neutrophilic dermatosis in humans. Citation Information: J Clin Invest. 2018;128(5):2076-2088. https://doi.org/10.1172/JCI96165. Increasing evidence suggests that synapse dysfunctions are a major determinant of several neurodevelopmental and neurodegenerative diseases. Here we identify protein kinase N1 (PKN1) as a novel key player in fine-tuning the balance between axonal outgrowth and presynaptic differentiation in the parallel fiber–forming (PF-forming) cerebellar granule cells (Cgcs). Postnatal Pkn1–/– animals showed a defective PF–Purkinje cell (PF-PC) synapse formation. In vitro, Pkn1–/– Cgcs exhibited deregulated axonal outgrowth, elevated AKT phosphorylation, and higher levels of neuronal differentiation-2 (NeuroD2), a transcription factor preventing presynaptic maturation. Concomitantly, Pkn1–/– Cgcs had a reduced density of presynaptic sites. By inhibiting AKT with MK-2206 and siRNA-mediated knockdown, we found that AKT hyperactivation is responsible for the elongated axons, higher NeuroD2 levels, and reduced density of presynaptic specifications in Pkn1–/– Cgcs. In line with our in vitro data, Pkn1–/– mice showed AKT hyperactivation, elevated NeuroD2 levels, and reduced expression of PF-PC synaptic markers during stages of PF maturation in vivo. The long-term effect of Pkn1 knockout was further seen in cerebellar atrophy and mild ataxia. In summary, our results demonstrate that PKN1 functions as a developmentally active gatekeeper of AKT activity, thereby fine-tuning axonal outgrowth and presynaptic differentiation of Cgcs and subsequently the correct PF-PC synapse formation. Citation Information: J Clin Invest. 2018;128(5):2089-2103. https://doi.org/10.1172/JCI96207. LN follicles constitute major reservoir sites for HIV/SIV persistence. Cure strategies could benefit from the characterization of CD8+ T cells able to access and eliminate HIV-infected cells from these areas. In this study, we provide a comprehensive analysis of the phenotype, frequency, localization, and functionality of follicular CD8+ T cells (fCD8+) in SIV-infected nonhuman primates. Although disorganization of follicles was a major factor, significant accumulation of fCD8+ cells during chronic SIV infection was also observed in intact follicles, but only in pathogenic SIV infection. In line with this, tissue inflammatory mediators were strongly associated with the accumulation of fCD8+ cells, pointing to tissue inflammation as a major factor in this process. These fCD8+ cells have cytolytic potential and can be redirected to target and kill HIV-infected cells using bispecific antibodies. Altogether, our data support the use of SIV infection to better understand the dynamics of fCD8+ cells and to develop bispecific antibodies as a strategy for virus eradication. Citation Information: J Clin Invest. 2018;128(5):2104-2115. https://doi.org/10.1172/JCI96582. Immune checkpoint blockade (ICB) has demonstrated curative potential in several types of cancer, but only for a small number of patients. Thus, the identification of reliable and noninvasive biomarkers for predicting ICB responsiveness is an urgent unmet need. Here, we show that ICB increased tumor vessel perfusion in treatment-sensitive EO771 and MMTV-PyVT breast tumor as well as CT26 and MCA38 colon tumor models, but not in treatment-resistant MCaP0008 and 4T1 breast tumor models. In the sensitive tumor models, the ability of anti–cytotoxic T lymphocyte–associated protein 4 or anti–programmed cell death 1 therapy to increase vessel perfusion strongly correlated with its antitumor efficacy. Moreover, globally enhanced tumor vessel perfusion could be detected by Doppler ultrasonography before changes in tumor size, which predicted final therapeutic efficacy with more than 90% sensitivity and specificity. Mechanistically, CD8+ T cell depletion, IFN-γ neutralization, or implantation of tumors in IFN-γ receptor knockout mice abrogated the vessel perfusion enhancement and antitumor effects of ICB. These results demonstrated that ICB increased vessel perfusion by promoting CD8+ T cell accumulation and IFN-γ production, indicating that increased vessel perfusion reflects the successful activation of antitumor T cell immunity by ICB. Our findings suggest that vessel perfusion can be used as a novel noninvasive indicator for predicting ICB responsiveness. Citation Information: J Clin Invest. 2018;128(5):2116-2126. https://doi.org/10.1172/JCI97992. BACKGROUND. Poly(ADP-ribose) polymerase (PARP) inhibitors are effective in a broad population of patients with ovarian cancer; however, resistance caused by low enzyme expression of the drug target PARP-1 remains to be clinically evaluated in this context. We hypothesize that PARP-1 expression is variable in ovarian cancer and can be quantified in primary and metastatic disease using a novel PET imaging agent. METHODS. We used a translational approach to describe the significance of PET imaging of PARP-1 in ovarian cancer. First, we produced PARP1-KO ovarian cancer cell lines using CRISPR/Cas9 gene editing to test the loss of PARP-1 as a resistance mechanism to all clinically used PARP inhibitors. Next, we performed preclinical microPET imaging studies using ovarian cancer patient–derived xenografts in mouse models. Finally, in a phase I PET imaging clinical trial we explored PET imaging as a regional marker of PARP-1 expression in primary and metastatic disease through correlative tissue histology. RESULTS. We found that deletion of PARP1 causes resistance to all PARP inhibitors in vitro, and microPET imaging provides proof of concept as an approach to quantify PARP-1 in vivo. Clinically, we observed a spectrum of standard uptake values (SUVs) ranging from 2–12 for PARP-1 in tumors. In addition, we found a positive correlation between PET SUVs and fluorescent immunohistochemistry for PARP-1 (r2 = 0.60). CONCLUSION. This work confirms the translational potential of a PARP-1 PET imaging agent and supports future clinical trials to test PARP-1 expression as a method to stratify patients for PARP inhibitor therapy. TRIAL REGISTRATION. Clinicaltrials.gov NCT02637934. FUNDING. Research reported in this publication was supported by the Department of Defense OC160269, a Basser Center team science grant, NIH National Cancer Institute R01CA174904, a Department of Energy training grant DE-SC0012476, Abramson Cancer Center Radiation Oncology pilot grants, the Marsha Rivkin Foundation, Kaleidoscope of Hope Foundation, and Paul Calabresi K12 Career Development Award 5K12CA076931. Citation Information: J Clin Invest. 2018;128(5):2127-2143. https://doi.org/10.1172/JCI98215. Citation Information: J Clin Invest. 2018;128(5):2144-2155. https://doi.org/10.1172/JCI96429. The apolipoprotein E E4 allele of the APOE gene is the strongest genetic factor for late-onset Alzheimer disease (LOAD). There is compelling evidence that apoE influences Alzheimer disease (AD) in large part by affecting amyloid β (Aβ) aggregation and clearance; however, the molecular mechanism underlying these findings remains largely unknown. Herein, we tested whether anti–human apoE antibodies can decrease Aβ pathology in mice producing both human Aβ and apoE4, and investigated the mechanism underlying these effects. We utilized APPPS1-21 mice crossed to apoE4-knockin mice expressing human apoE4 (APPPS1-21/APOE4). We discovered an anti–human apoE antibody, anti–human apoE 4 (HAE-4), that specifically recognizes human apoE4 and apoE3 and preferentially binds nonlipidated, aggregated apoE over the lipidated apoE found in circulation. HAE-4 also binds to apoE in amyloid plaques in unfixed brain sections and in living APPPS1-21/APOE4 mice. When delivered centrally or by peripheral injection, HAE-4 reduced Aβ deposition in APPPS1-21/APOE4 mice. Using adeno-associated virus to express 2 different full-length anti–apoE antibodies in the brain, we found that HAE antibodies decreased amyloid accumulation, which was dependent on Fcγ receptor function. These data support the hypothesis that a primary mechanism for apoE-mediated plaque formation may be a result of apoE aggregation, as preferentially targeting apoE aggregates with therapeutic antibodies reduces Aβ pathology and may represent a selective approach to treat AD.